I'm not super strict about it, but I try to keep my meal preps as healthy and varied as possible - including lots of fresh vegetables, lean protein and fibre, and minimising excess fat and carbs. The way I see it, if I'm inhaling a meal at my desk, it may as well be doing me good! Health concerns aside, I find that eating a carb-heavy lunch can make me quite sleepy in the afternoon, so that's another consideration. So, when I made my curries for the week ahead, I thought cauliflower rice might be a nice accompaniment rather than the usual rice or flatbread. (All the vitamins and fibre of the cauliflower, none of the soporific carbs). And that was it! It took less than fifteen minutes to make, and was so incredibly delicious. I know I made this with health concerns in mind, but it certainly didn't feel like self-sacrificing "diet" food. It was just a great dish. If you are trying to cut down on carbs or calories, then I think this would be the perfect recipe for you. The texture of the cauliflower is rather like couscous (and actually check out my cauliflower couscous recipe), and it works really well as a base for curries or other dishes with lots of sauce or gravy. I would happily eat this pulao any day (or night) of the week. Chop the cauliflower into medium florets. 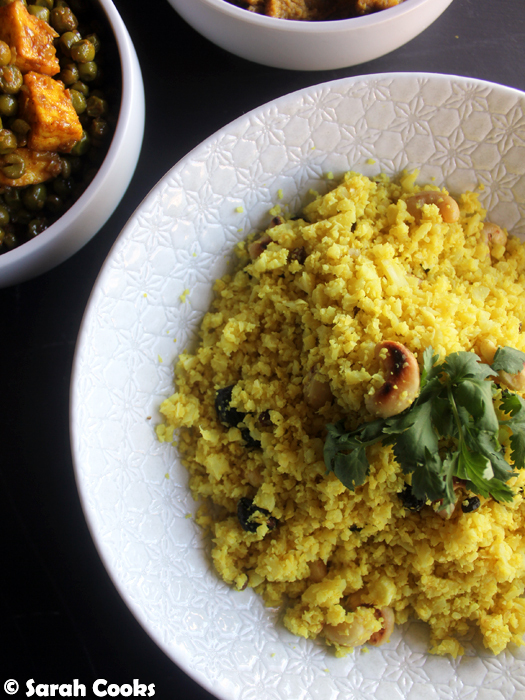 Place in a food processor and pulse until it turns into small pieces, like rice or couscous. Heat the oil in a large frying pan over a medium high heat. Add the cauliflower rubble and stir through. Add the turmeric, cumin and coriander, and stir until the spices are evenly distributed through the cauliflower. Meanwhile, toast the cashews in a dry frying pan until golden brown. 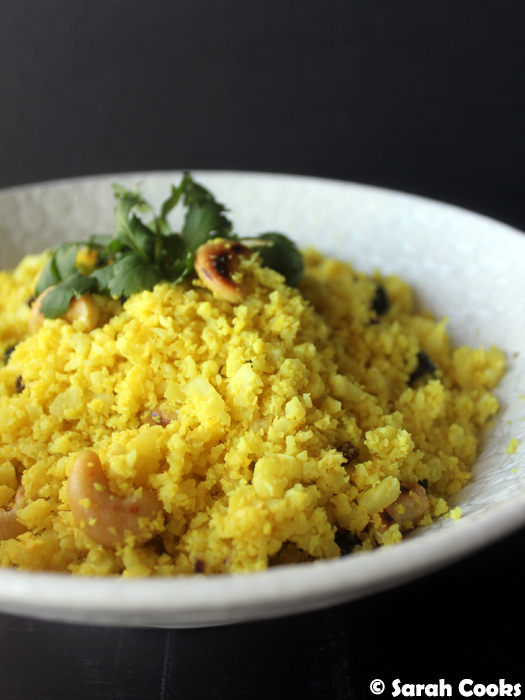 Add the toasted cashews to the cauliflower rice with the currants, stir through and cook for a further minute.